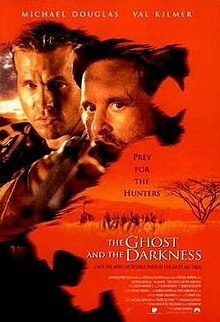 The Ghost and the Darkness is a 1996 American historical adventure film directed by Stephen Hopkins and starring Val Kilmer and Michael Douglas. The screenplay was written by William Goldman. The story is a fictionalized account of the Tsavo Man-Eaters, two Tsavo lions that attacked and killed workers at Tsavo, Kenya, during the building of the Uganda-Mombasa Railway in East Africa in 1898. The film received a mixed critical response upon release and later won the Academy Award for Best Sound Editing for supervising sound editor Bruce Stambler. In 1898, Sir Robert Beaumont, the primary financier of a railroad project in Tsavo, Kenya, is furious because the project is running behind schedule. He seeks out the expertise of Lt. Colonel John Henry Patterson, a British military engineer, to get the project back on track. Patterson travels from England to Tsavo, telling his wife, Helena, he will complete the project and be back in London for the birth of their son. He meets British supervisor Angus Starling, Kenyan foreperson Samuel, and Doctor David Hawthorne. Hawthorne tells Patterson of a recent lion attack that has affected the project. That night, Patterson kills an approaching lion with one shot, earning the respect of the workers and bringing the project back on schedule. However, not long afterwards, Mahina, the construction foreman, is dragged from his tent in the middle of the night. His half-eaten body is found the next morning. Patterson then attempts a second night-time lion hunt, but the following morning, another worker is found dead at the opposite end of the camp from Patterson's position. Patterson's only comfort now is the letters he receives from his wife. Soon, while the workers are gathering wood and building fire pits around the tents, a lion attacks the camp in the middle of the day, killing another worker. While Patterson, Starling and Samuel are tracking it to one end of the camp, another lion leaps upon them from the roof of a building, killing Starling with a slash to the throat and injuring Patterson on the left arm. Despite the latter's efforts to kill them, both lions escape. Samuel states that there has never been a pair of man-eaters; they have always been solitary hunters. The workers, led by Abdullah, begin to turn on Patterson. Work on the bridge comes to a halt. Patterson requests soldiers from England to protect the workers, but is denied. During a visit to the camp, Beaumont tells Patterson that he will ruin his reputation if the bridge is not finished on time and that he will contact the famous hunter Charles Remington to help because Patterson has been unable to kill the animals. Remington arrives with skilled Maasai warriors to help kill the lions. They dub the lions "the Ghost" and "the Darkness" because of their notorious methods of attack. The initial attempt fails when Patterson's borrowed gun misfires. The warriors decide to leave, but Remington stays behind. He constructs a new hospital for sick and injured workers and tempts the lions to the abandoned building with animal parts and blood. When the lions fall for the trap, Remington and Patterson shoot at them; they flee and attack the new hospital, killing many patients and Hawthorne. Abdullah and the construction men leave, and only Patterson, Remington, and Samuel remain behind. Patterson and Remington locate the animals' lair, discovering the bones of dozens of the lions' victims. That night, Remington kills one of the pair by using Patterson and a baboon as bait, but the next morning Patterson discovers that the remaining lion has dragged Remington from his tent and killed him. Patterson and Samuel cremate Remington's corpse on a pyre at the spot where he died. Grief-stricken and desperate to end the carnage, the two men burn the tall grass surrounding the camp, driving the surviving lion toward the camp and the ambush that they set there. The lion attacks them on the partially constructed bridge, and after a lengthy fight Patterson finally kills it. Abdullah and the construction workers return, and the bridge is completed on time. The film is based upon The Man-Eaters of Tsavo by Lieutenant Colonel John Henry Patterson, the man who actually killed both real lions. William Goldman first heard about the story when travelling in Africa in 1984, and thought it would make a good script. In 1989 he pitched the story to Paramount as a cross between Lawrence of Arabia and Jaws, and they commissioned him to write a screenplay which he delivered in 1990. "My particular feeling is that they were evil," said Goldman of the lions. "I believe that for nine months, evil popped out of the ground at Tsavo." The script fictionalises Patterson's account, introducing an American big game hunter called Charles Remington. The character was based on Anglo-Indian big game hunter Charles H. Ryall, superintendent of the Railway Police. In original drafts the character was called Redbeard, and Goldman says his purpose in the story was to create an imposing character who could be killed by the lions and make Patterson seem more brave; Goldman says his ideal casting for the role would have been Burt Lancaster. According to Goldman, Kevin Costner expressed interest in playing Patterson, but Paramount wanted to use Tom Cruise who ultimately declined. Work on the film slowed until Michael Douglas moved his producing unit with partner Steven Reuther, Constellation Films, to Paramount. Douglas read the script and loved it, calling it "an incredible thriller about events that actually took place." Douglas decided to produce and Stephen Hopkins was hired to direct. Val Kilmer, who had just made Batman Forever and was a frequent visitor to Africa then expressed enthusiasm for the script, which enabled the project to be financed. The part of Remington was originally offered to Sean Connery and Anthony Hopkins but both declined; the producers were considering asking Gérard Depardieu when Douglas decided to play the role himself. Stephen Hopkins later said he was unhappy about this. In early drafts of the script, Remington was originally going to be an enigmatic figure but when Douglas chose to play him, the character's role was expanded and was given a history. In Goldman's book Which Lie Did I Tell?, the screenwriter argues that Douglas' decision ruined the mystery of the character, making him a "wimp" and a "loser". The film was shot mainly on location at Songimvelo Game Reserve in South Africa, rather than Kenya, due to tax laws. Many Maasai characters in the film were actually portrayed by South African actors, although the Maasai depicted during the hunt were portrayed by real Maasai warriors who were hired for the movie. 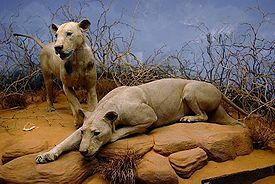 While the real man-eaters were, like all lions from the Tsavo region, a more aggressive, maneless variety, those used for filming were actually the least aggressive available, for both safety and aesthetic reasons. The film's lions were two male lions with manes. They were brothers named Caesar and Bongo, who were residents of the Bowmanville Zoo in Bowmanville, Ontario, Canada, both of whom were also featured in George of the Jungle. The film also featured three other lions: two from France and one from the USA. We had snake bites, scorpion bites, tick bite fever, people getting hit by lightning, floods, torrential rains and lightning storms, hippos chasing people through the water, cars getting swept into the water, and several deaths of crew members, including two drownings.... Val came to the set under the worst conditions imaginable. He was completely exhausted from doing The Island of Dr. Moreau; he was dealing with the unfavorable publicity from that set; he was going through a divorce; he barely had time to get his teeth into this role before we started; and he is in nearly every scene in this movie. But I worked him six or seven days a week for four months under really adverse conditions, and he really came through. He had a passion for this film. The film won the Academy Award for Best Sound Editing (Bruce Stambler) at the 69th Academy Awards. However, Val Kilmer was nominated for the Razzie Award for Worst Supporting Actor. Reviews were mixed, with Rotten Tomatoes giving it a 52% rating based on 46 reviews. Roger Ebert said the film was so awful it "lacked the usual charm of being so bad it's funny" adding it was "an African adventure that makes the Tarzan movies look subtle and realistic". Ebert would put the film on his list of the worst movies of 1997. Conversely, the late David R. Ellis listed this film at #8 on his "Top 10 Animal Horror Movies" countdown, a list he made to promote the release of Shark Night 3D. Hopkins said in a 1998 interview that the film "was a mess... I haven't been able to watch it." In India, the film was remade in Telugu as Mrugaraju and released in 2001. The Ghost and the Darkness was released by Paramount Home Video on VHS on April 1, 1997. Later on, the film is available as a one-disc DVD. There are no special features besides a theatrical trailer for the film. The film was released on LaserDisc in 1997 as a one-disc, double-sided release featuring a Dolby Digital audio track. Patterson's 1907 book itself states that "between them (the lions) no less than 28 Indian coolies, in addition to scores of unfortunate African natives of whom no official record was kept" were killed. This lesser number was confirmed in the definitive paper on man-eating behavior and the Tsavo lions by Kerbis Peterhans and Gnoske (2001) and soon thereafter in Dr. Bruce Patterson's definitive book The Lions of Tsavo: Exploring the Legacy of Africa's Notorious Man-Eaters published by McGraw-Hill in 2004. Patterson wrote the book at the Field Museum in Chicago, where the lions are on display. Kerbis Peterhans & Gnoske showed that the greater toll attributed to the lions resulted from a pamphlet written by Col. Patterson in 1925, stating "these two ferocious brutes killed and devoured, under the most appalling circumstances, 135 Indian and African artisans and laborers employed in the construction of the Uganda Railway." The location where the bridge was built is now called Man-Eater's Camp. It is in Tsavo East National Park, Kenya, about 125 kilometres (78 mi) east of Mount Kilimanjaro and 260 kilometres (160 mi) southeast of Nairobi, at 2°59′37″S 38°27′41″E﻿ / ﻿2.993558°S 38.461458°E﻿ / -2.993558; 38.461458. ^ ""The Ghost and the Darkness" – Business". Internet Movie Database. Retrieved May 6, 2016. ^ "The Ghost and the Darkness (1996)". Box Office Mojo. December 6, 1996. Retrieved January 15, 2013. ^ "The Ghost and the Darkness (1996)". World Wide Box Office. Retrieved January 15, 2013. ^ "The 69th Academy Awards – 1997". Retrieved 7 September 2017. ^ Goldman (2000), pp. 72–74. ^ a b c Dawes, Amy (10 October 1996). "The Lion Sleeps Tonight: Troubles on this film weren't caused by the cats or reputed bad boy Kilmer". Daily News. Los Angeles. p. L.3 – via The Free Library. ^ Patterson, Bruce D. (2004). The Lions of Tsavo: Exploring the Legacy of Africa's Notorious Man-Eaters. McGraw Hill Professional. p. 33. ISBN 978-0-07-136333-4. ^ Goldman (2000), p. 89. ^ a b Logan, Brian (29 July 1998). "Arts: Some of Stephen Hopkins's films are so bad he can't bear to watch them... But Lost In Space is different. Brian Logan meets the man who won the hearts of Heather Graham and Hollywood". The Guardian. London, UK. p. 14. ^ Goldman (2000), pp. 91–93. ^ "The Ghost and the Darkness (1996)". Rotten Tomatoes. Retrieved 12 November 2018. ^ Ebert, Roger (October 11, 1996). "The Ghost And The Darkness". Chicago Sun-Times. Retrieved May 3, 2010. ^ "Fall Preview: "Shark Night 3D" director David Ellis' top 10 animal horror movies". IFC. August 23, 2011. Retrieved September 10, 2012. ^ "Man eating lions – not (as) many dead". Railway Gazette International. November 27, 2009. ^ Kerbis Peterhans, Julian C.; Gnoske, Thomas Patrick (2001). "The Science of 'Man-Eating' Among Lions (Panthera leo). With a Reconstruction of the Natural History of the 'Man-Eaters of Tsavo'". Journal of East African Natural History. 90 (1): 1–40. doi:10.2982/0012-8317(2001)90[1:TSOMAL]2.0.CO;2. ^ Patterson, J. H. (1925). The man-eating lions of Tsavo. Zoology: Leaflet 7. Field Museum of Natural History, Chicago. p. 89. Goldman, William (2000). Which Lie Did I Tell?. Bloomsbury. ISBN 978-0-74754-977-2.